It is Saturday 13th June 1761. A heavy wagon laden with sacks of wheat and drawn by six horses is trundling along the highway across the common in Sutton Coldfield, The driver is Richard Reynolds, son of the miller at Longmoor Mill, so perhaps that is where the wagon is heading. Also on the wagon is John Chamberlain, whose father-in-law, Thomas Kirkham is the owner of the vehicle; John Chamberlain tries to climb off the wagon at the front end, but falls to the ground, and when they go to help him up they find that he is dead. The body was carried to Thomas Kirkham’s house, and the authorities were notified - it was a suspicious death, so the Coroner had to hold an inquest. The town charter of 1528 established the governing body of Sutton as the Warden and Society (effectively a Mayor and Corporation), a new Warden to be elected each year, one of his functions being to act as Coroner in the town. The Warden of Sutton Coldfield in 1761 was Mr. Joseph Duncomb, and he summoned twelve jurymen to attend the inquest on Monday 15th June at Thomas Kirkham’s house. John Chamberlain’s body was lying in Thomas Kirkham’s house, and the jury could view it - they determined that the wagon had bruised him a little, but “neither the Waggon nor the Horses were the immediate cause of his death”. They would have inspected the wagon to see that it was not in a dangerous condition, and witnesses would have testified to the docility of the horses, otherwise the vehicle could be condemned or the horses destroyed. The jury returned a verdict of accidental death, saying that they “rather apprehend that as he had had two Strokes of the Palsy some time before it might please God to afflict him at that time with something of the like nature which might be the cause of his death.” Sudden death from strokes or heart attacks was not unknown in the seventeenth century. The wagon-load of wheat was perhaps headed for Longmoor Mill along Chester Road, but Walmley Road was another highway across a common, and led towards New Hall Mill, which was much busier than Longmoor, so John Chamberlayne may have been on his way there. New Hall Mill will be open on Sunday 14th September, where you can see an old wagon in the wagon shed and feel the weight of the sacks of corn waiting to be milled - Chamberlayne had no doubt helped load the wagon with even heavier sacks, which may have been bad for his heart. 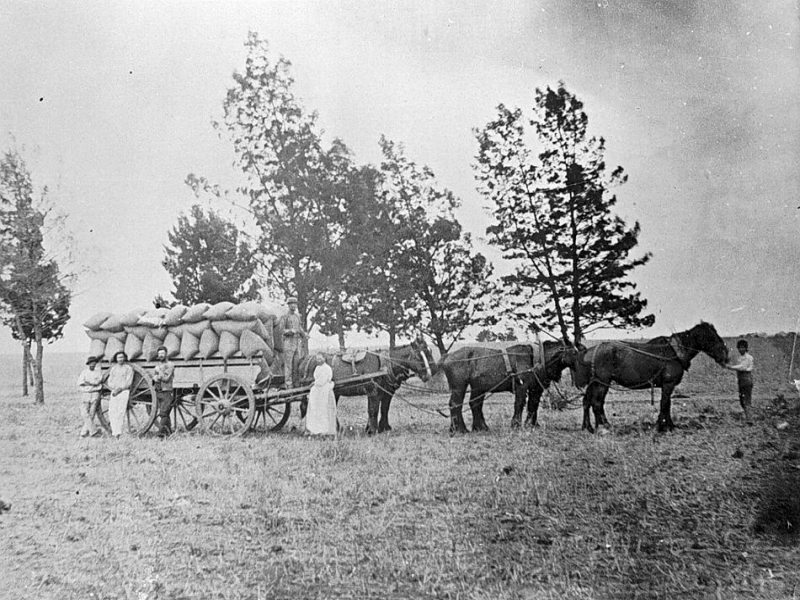 A nineteenth century Australian example of a wagon laden with sacks of grain, requiring a team of six horses to move it.